Mustang insurance varies widely by country state, province and area. Here's how to get the best insurance rates. Insurance costs for your Mustang can vary by age, model and engine choices as well as your driving history. 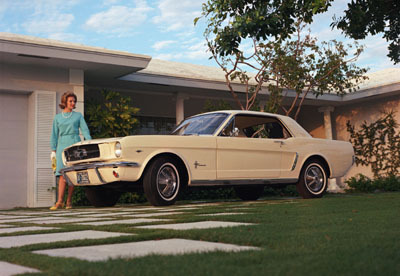 Generally speaking, a Ford Mustang insurance quote is going to be higher for a V8 car than a V6 equipped pony car for any given year. In the case of a classic Mustang, the exceptions could be a situation, where the V8 car is a coupe and the 6 cylinder car is a convertible. The reason, is that the convertible can be a more popular car, even with a six, and its value may be higher. The other situation that could affect your insurance rates would be comparing a coupe to a fastback. Again, a fastback car is generally more desirable, so the fastback could carry a higher value with the inline six or later cars with the V6 engines. Whether you live in a "no fault" insurance area or not, your driving record can greatly change what you have to pay in insurance premiums and other costs for your Mustang. If your Pony Car is a collector car, you may have other options from your insurance provider when you are getting insurance quotes for Mustangs. The usual variations include collector car insurance, where a value is agreed upon and the limit of miles or kilometers per year is set at a maximum. Many of these policies limit mileage to around 600- 1,000 miles total per year. If you live in an area that requires mandatory emissions testing, you may also get a break on acceptable emission levels to get a pass, if you have collector car status. We're all on budgets, and finding a good deal on your Ford Mustang insurance is no different. One area that you can help your monthly or annual insurance costs, is setting a deductible level that you can live with. Reducing the deductible increases your premiums, so figure out, in a worst case scenario what you could live with,if you had to pay a higher deductible and compare it to the differences in premiums. If this seems sensible, then it could reduce your rates. In the past, depending on the condition of your car, reducing or eliminating this coverage could result in substantially lower premiums. Now it's less of a deal, but still worth looking into, to bring your rates down. The last point to look at, particularly if you are looking to buy a Mustang, is to see what rate classification the car you're looking to buy is in. For instance, many companies consider the V8 Mustang a sports car, but not all consider the V6 equipped cars as such. If owning a Mustang with cheap insurance rates is more important than having one with a V8, its a good idea to check out insurance premiums for Mustangs you like, before you make a decision on buying. That choice could save you money for a long time to come. Return from Mustang insurance to Ford Mustang home.